Bill O'Reilly Has Divine Mission To Save Christmas, Praise Jesus & Fox News! Bill O'Reilly's delusional and dualistic world is one in which he is endlessly fighting for "Judeo-Christian traditions" which are being endlessly attacked by the evil forces of secular-progressivism and the "gay agenda." 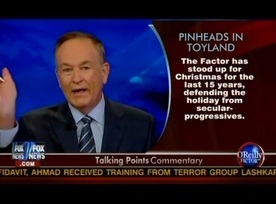 During this week's "Culture Warrior" Segment, Bill continued with his paranoid and now patented whine about this battle for the soul of America - a battle affirmed by his lovely fellow Christmas warriors one of whom was Gretchen Carlson who earned her Factor billet as a result of her militancy about the"War on Christmas." But more importantly, Bill, once again reminded us that he is on a mission from God to lead the battalions in a war that exists only in his twisted mind. FACT CHECK: What Bill didn't mention was that the issue involved an annual concert given by a public high school. The proceeds from the ticket sales, handled by the church, have been going to the church's Christian ministry. After a complaint from the secular group, the Hawaii Department of Education, in consultation with the Attorney General's office, cancelled the concert. Would Bill want proceeds, from a Manhasset public school concert, to go to - say - a Muslim ministry?? Bill wanted to know is "there's a growing anti-Christian bias in America." Jeanine Pirro proclaimed her Catholicism (she's divorced after a "tumultuous" marriage) and heartily agreed with Bill. She claimed that there have always been Nativity scenes and Menorahs but "all of a sudden" there has been, through political correctness, a "direction to reduce the number of religiously identified displays." She noted that the courts are suppressing these displays. FACT CHECK - Court cases involving Nativities go back to 1969. She opined that "the First Amendment has the Establishment Clause and it says there is no way that you can interrupt the establishment of a religion or prohibit the free exercise of religion" adding that “It doesn’t give you freedom from religion, and that is what my objection is. "Bill agreed that "it's a freedom of speech" thing and lied about the Arkansas case "where the church was attacked for putting on a play called "Merry Christmas Charlie Brown." FACT CHECK - The church was not attacked. After parents complained about a public school sending children to a Christian themed play, at a Christian church, the church cancelled the play so that the school would not have to get in a legal fight. The play will still be held, on a Saturday, without school involvement. O'Reilly scolded the churches for not doing their jobs and proclaimed that he "has to lead this campaign" at which point Jesus BFF, Gretch said "I'm leading it, too." Wow, Gretch and Bill are co-leaders in the war on Christmas. Beyond being "nuts," they are truly batshit crazy! * Funny, Gretch didn't complain when two Christian gals scuttled an entire school project. Bildo has been fighting too many bogus culture wars for too many years. He has become emotionally unhinged. Time to pack him off to the old folks home where most of his audience already resides. Little Billy EGO’reilly must have read a lot of comic books as a child, to have developed this Moral Arbitor Of The Universe Super Hero Complex. Absolutely!!! And they owe it all to assholes like Gretch & Bildo who make reasonable revolt at being associated with their craziness. Good christians (assuming they still exist) need to disassociate themselves from this paranoia.